Bellet is my local Appellation d’Origine Protegée (or Côntrolée as it used to be known. Côntrolée is the word most in use, but the producers of Bellet have been more amenable to the change on the whole). This is a fantastically historic wine region with evidence of Roman winemaking, and olive growing, going back more than two thousand years. 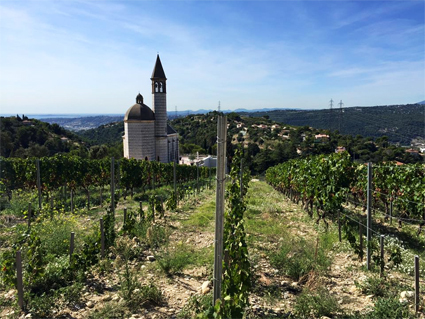 Indeed, the village at the centre of the Appellation, and which gave it its name, is St Roman de Bellet. Saint Roman was a Roman Martyr in the 3rd Century. During the French Revolution the village was called, appropriately enough, Bacchus. 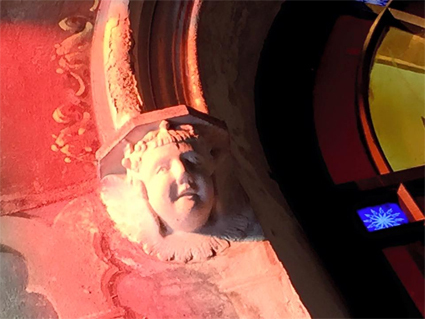 There’s not much Roman left – on the surface at least – because Bellet has been prime real estate for centuries and probably was even in Roman times. But there are Roman caves underneath Château de Crémat. More recently, Thomas Jefferson wrote that he had enjoyed the “great wine” of Nice, during a visit to the region. This is France’s only truly urban appellation (according to the Mairie of Nice at least), and while this is a selling point in terms of tourism, access and location, it presents its own problems. Land here is very expensive. For many years, it has been far more profitable to build villas and swimming pools than grow grapes. The region had its own versions of the difficulties following the Phylloxera and Oidium epidemics, and after the Second World War, much of the agricultural land was given over to flower growing because this was both a more immediate crop, and easier to work for the largely female population left to do so. Of a total potential area of 650ha, only 62ha are planted to vines currently, and this figure is not really growing. 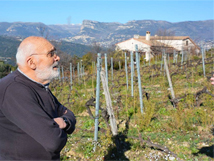 Although as Nathalie and Jean Patrick Pacioselli of Domaine St Jean discovered, it is not terribly easy to get a new ‘droit de planter’ even if you want to! Most of the remaining vineyard land would not be suitable for building on, even if permission to do so were granted, which is in itself unlikely. Nevertheless any new buyer would be under no obligation to maintain vineyards, so this Appellation is fragile in its tininess. The 62ha are now worked by just 10 producers, for only 6 of whom it is a livelihood (the smallest vineyard holding, Domaine Vinceline is just 0.8ha). Even the largest, Château de Crémat, has only 13ha. Rather like the Napa Valley, because the pressure on land prices is so high, the wines need to be expensive to justify their continuing existence, and because of that, the quality has to be high. Even a certain local celebrity is not enough for these relatively highly priced wines to survive if they do not outperform their competition from Provence and elsewhere in France, and beyond. The appellation rules are strict and a maximum yield of 40hl/ha is permitted, although many of the vineyards are so steep that even this is a lofty ambition. So, Grand Cru Burgundy levels are the norm. Suddenly, the prices seem rather more reasonable. 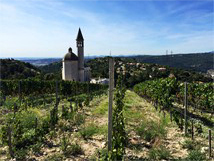 Bellet sits atop a ridge of the Alpes-Maritimes which extends to the sea as part of the city of Nice. The vineyards face to the west, protected from both the sea breezes (which can be hot, dry and sandy in summer) and the worst of the cold Mistral which can make the winter very harsh. In fact the morning winds come from the mountains down the valley of the river Var (which forms the border between Provence and the part of the Alpes Maritimes that was ceded to Napoleon in 1860) and return up in the evening. This creates a great diurnal variation in the vineyards, which are at an altitude of 200 – 350m, and lengthens the growing season from what it might otherwise be at this latitude on the Mediterranean coast. The soils are poor marine gravels and sand (so much sand in fact that one producer, Jean Spizzo of Collet de Bovis is replanting vineyards by layering, thus exposing the vines to phlylloxera, so far without incident). Where Provence planted endless hectares of Aramon and Ugni Blanc (and worse) after phylloxera in an effort to re-establish an industry quickly, Bellet returned to its classics, and this helped to establish its reputation for supreme quality. For the whites, this is Rolle (aka Vermentino) – remember that this part of the world is as Italian as many places in today’s Italy, having once been part of the Kingdom of Savoy like Piemonte. As of 1961 producers can include some Chardonnay, but this is rarely more than 10%. For the Rosés, comes the first of Bellet’s unique varieties, Braquet. This wild strawberry, pink grapefruit and rose petal scented variety is delightful, and makes more serious, deeper-coloured and drier (by law in fact, the maximum sugar permitted to remain is 3g/L) food-worthy rosés than Provence. Just as well given what needs to be charged for them. Braquet (named after an historic local family) can be augmented with some Grenache and Cinsault. Bellet Rouge must be predominantly Folle Noire. Unique to Bellet, ‘Crazy Black’ is so-called because of its capricious nature, late harvest (for the south of France, well into October) and difficulty to grow. 40hl/ha is simply a loopy pipe-dream for its growers most years. Folle Noire is unrelated to the more widely planted and considerably less distinguished Folle Blanche of Armagnac, whose craziness is most likely related to its overzealous vigour. Producers can include some Cinsault, Grenache and Braquet in the reds and almost all do. Gio Sergi at Clos St Vincent has made a 100% Braquet rouge from the 2015 harvest which he let me taste and very delicious (and surprisingly deeply coloured) it is too. Such a wine could scarcely be any more ‘Bellety’, but nevertheless would only qualify as a Vin de France or IGP Alpes Maritimes, because Bellet Rouge has to be >60% Folle Noire. I suspect that this would not really worry him, as he has already made a pure Grenache that sports Vin de France on its label. In any case he is just as likely to use the Braquet for blending in the spring. The producers throughout the appellation farm organically (‘Agriculture Bio’ in French), which apart from a few mono-appellations (owned entirely by one producer, such as La Coulée de Serrant), must further make Bellet unique in France. The amiable Jean Spizzo makes wines of class and structure, his red is especially spicy and noteworthy. Famous for the lavish parties thrown by a previous owner, Irène Bretz who helped establish the reputation of Nice’s famous Negresco hotel which she also owned. One of her guests was Gabrielle ‘Coco’ Channel who appropriated (with permission) the interlocking two Cs logo for her brand, but the company would not let Château de Crémat use it again when they recommenced producing wine after WWII. The most famous wine, possibly of the whole appellation, is Crémat’s honeysuckle and peach flavoured Blanc, which is oak fermented and aged, uses 5% Chardonnay and is released after several years in bottle. Probably the most famous producer and much loved of the Revue de France, Gault&Millau etc, Château de Bellet has been revitalised of late following a number of changes of hands and investment. The whites are best, and although the top wine, La Chapelle has a lofty price of €59, it shows its 10% Chardonnay, use of oak, malolactic, lees and limited yields well. Run by the energetic and local ambassador Joseph (Gio) Sergi, there is much experimentation here as well as the only distillery in the region producing some exceptional Marc, one of which is 10 year aged. Gio’s oak aged white shows perhaps why Bellet is most famous for the best expression of Rolle, and it offers a deep textured and flavoured wine which could easily be mistaken for a top Burgundy. Eric Dalmasso has taken over from his parents here and is crafting some of the best less-known wines of the Appellation. I am an especial fan of his red which shows a great balance of the spicy, violet – almost Syrah-like quality of Folle Noire along with a deft use of oak. 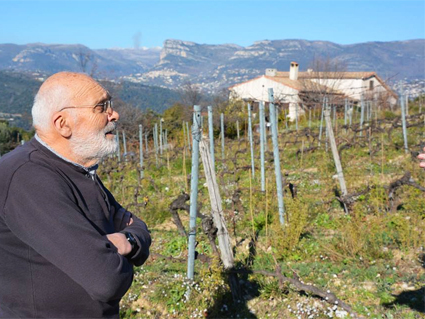 The charming Nathalie and Jean-Patrick Pacioselli are the ‘new kids on the block’, having only returned to Nice (Jean Patrick is Niçois, Nathalie from the Gorge du Verdon) in 2006, to begin establishing a new Bellet vineyard. 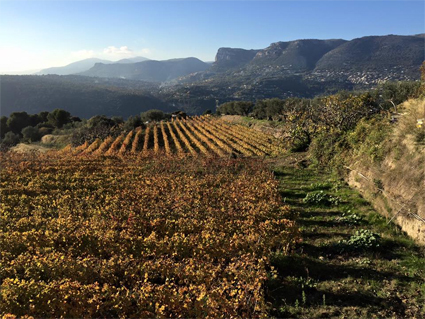 They originally leased a small 0.5ha parcel while they planted their own 1.5ha vineyard with all the local varieties, encountering all the multilayered French bureaucracy at its best on the way. Having lost almost their entire Folle Noire crop to a wild boar invasion in 2013, they have no red left to sell currently, but their stars are the delicious redcurrant, strawberry and wild mint scented Rosé, and the barrel matured, Meursault-esque white. They also produce a marc/grappa called ‘Branda’, named after a mis-hearing of the post prandial requests of the English Victorian visitors to the Riviera (Brandy is not a word familiar to the French. They may have meant Cognac, but they soon enough got something enterprisingly a little more local). I hope to taste the wines of the other four (all but one smaller) producers at the next Portes Ouvertes in the Spring to bring this report up to date.